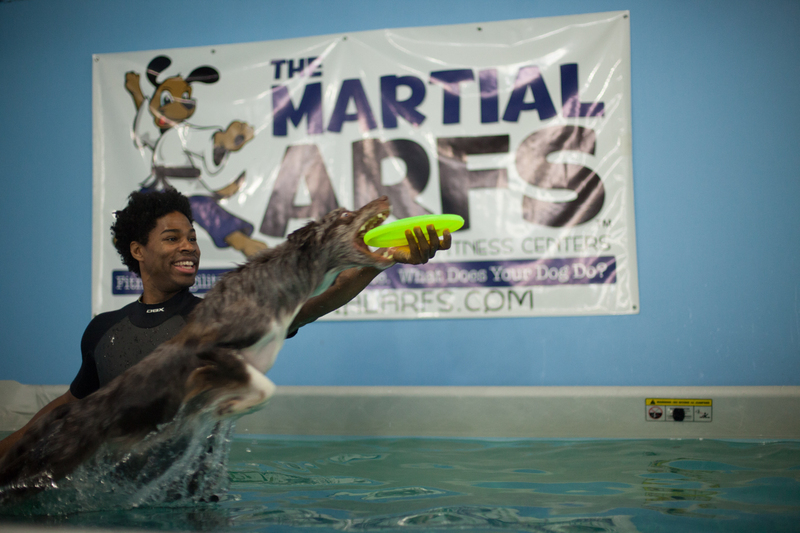 At The Martial ARFS™ we use our pool for a variety of water based exercises that go well beyond swimming. We call them Open Water Exercises (OWE) or Aquatic Conditioning, and you can have your dog perform them in a pool or any other open body of water. 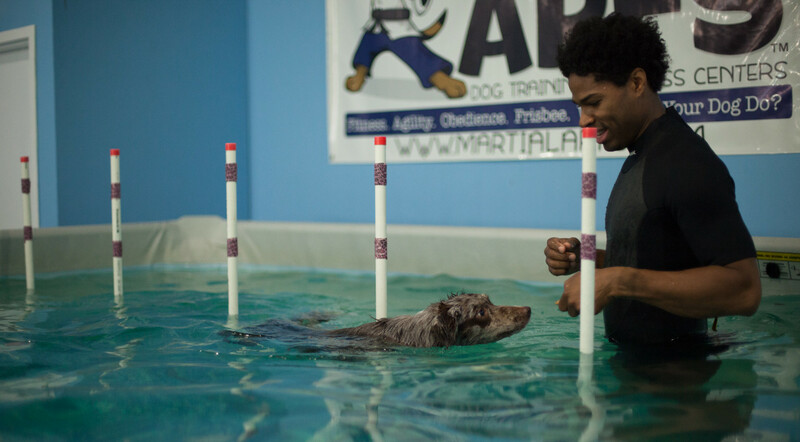 The purpose of Open Water Exercise is to incorporate a variety of exercises into a canine athlete or a companion dog’s conditioning program that use water to provide resistance, buoyancy, instability, challenge, and/or safety. Swimming. This is a great conditioning exercise for dogs. For cardio vascular endurance, strength, ease on the joints, AROM and fun. There are few activities that can beat it for it’s versatility. Since your dog’s feet remain free to move (unfixed) there is significant recruitment of the core and trunk muscles for twisting & turning. 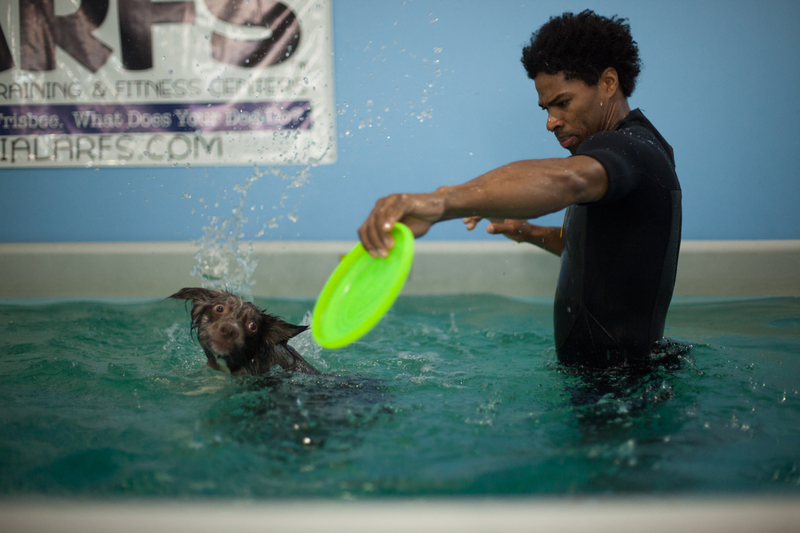 Rue will receive numerous benefits from swimming on a regular basis. There are a variety of methods to increase intensity (resistance bands, weighted vest, current, etc), or increase relaxation (warm water, coddling, stretching, etc). You can recreate particular movements of your sport (weaving, jumping, catching, turning, etc), or just swim for cross training. 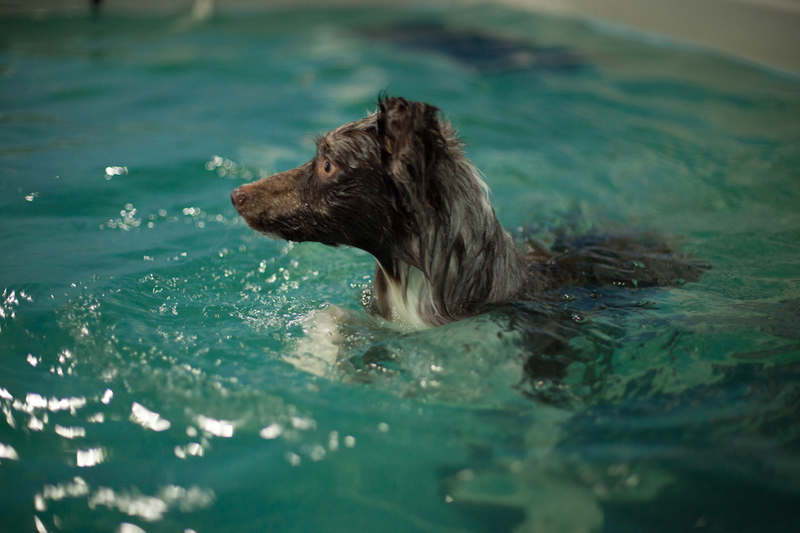 It’s important for your dog to be relaxed and enjoy swimming, panic will not provide a good experience or a valuable conditioning exercise. Walking/Trotting The resistance of the water while walking, trotting, or even running your dog while in the water, strengthens muscles that perform the exact movements dogs use on land. This can be done at a variety of depths and speeds along the shore of any beach or lake. If you have a pool, you can build a bench to walk or (depending on the length) trot your dog back and forth to provide a similar benefit to that of an Underwater Treadmill. The force necessary to push the water out of the way while walking/trotting provides strength training for the exact muscles used for walking/trotting. As well, with enough room, we can do combination gaiting exercises (walk, trot, walk, run, and/or jump) and because there’s no moving belt, we can even do caveletti bars. 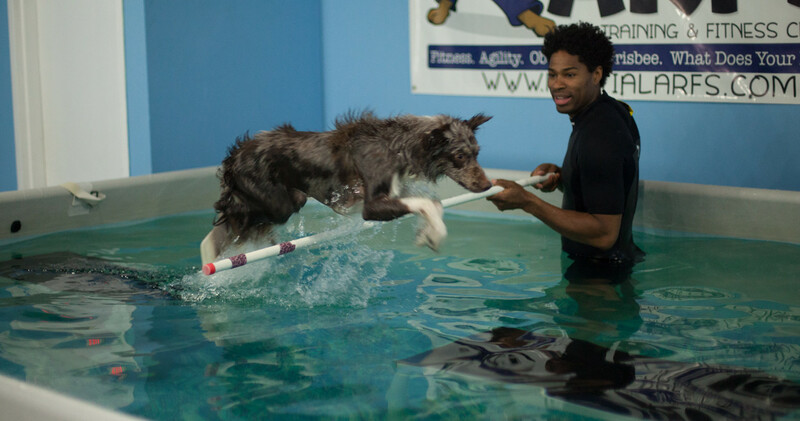 Walking or trotting your dog through water is great for dogs who like the water, but may panic when made to swim or may become anxious from the movement or confinement of an UWTM. 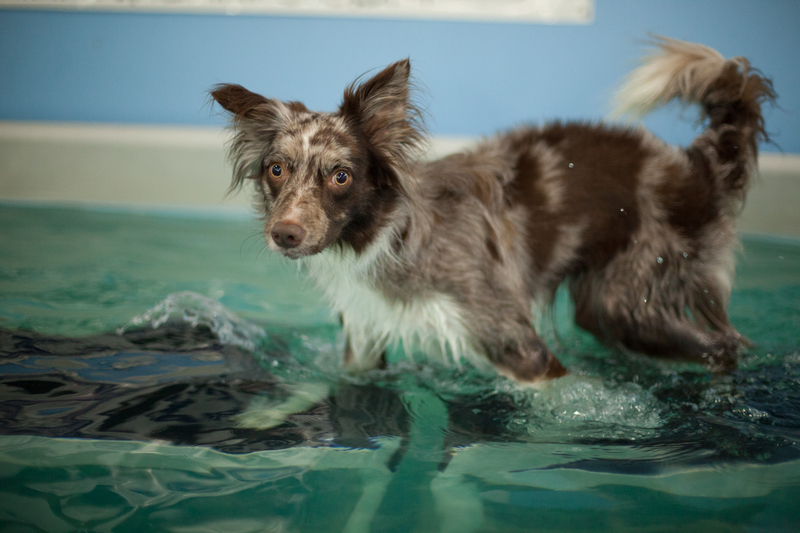 In still waters it is especially beneficial for dogs that have trouble walking due to injury, surgery or other ailment. Rue performs the same jumping motion while in the water, even without being able to push off the ground. This develops a tremendous amount of core strength. Water Resistance Jumps. 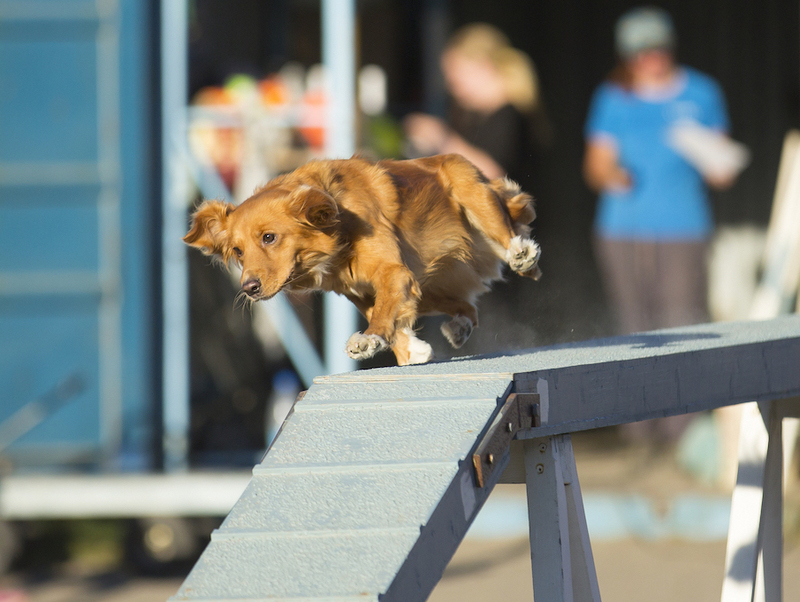 Jumping is a part of practically every canine sport. 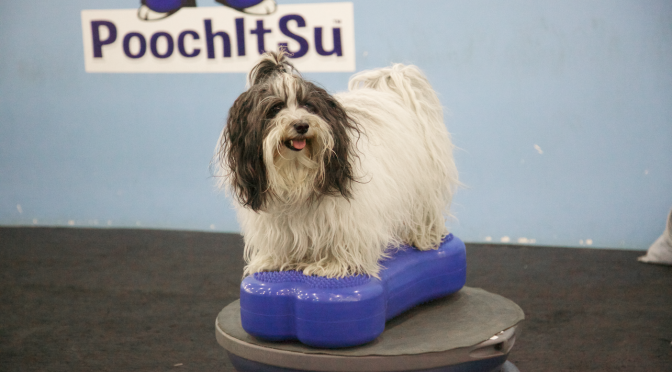 However, jump training can be very destructive to your dog’s joints at any age. From my previous posts, we know that in order to build strength we need to increase intensity. Intensity is increased through speed or resistance. However, with jumping, due to it’s concussive nature, the speed we need, combined with the resistance we need, combined with the repetitions we need, in order to make improvements we need, can cause injury. Jumping your dog through the water creates a great resistance exercise that is highly functional, with less chance of injury. Rue is jumping over the bar and will land with less force because of the water. You can jump for distance or height from “dry land” to water. You can jump for height or distance from water up to “dry land” or from water to water. 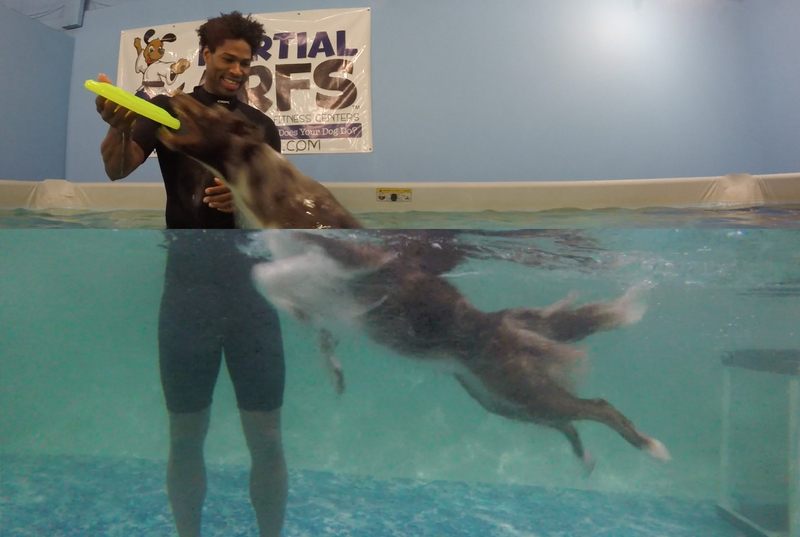 Jump training through water will build tremendous jumping power because your dog has to drive through the water to the area that you dictate. Your dog’s landing will have far less impact on their joints because they’re either landing in the water, or if your dog is jumping up to “dry land” there is little to no landing impact. (In Air) Core Conditioning & Body Awareness All core conditioning and body awareness exercises are done with feet fixed or touching a surface. To improve aerial body awareness and core strength, we need to include core exercises and body awareness drills in the air, or without feet fixed or touching a surface. Open Water Exercise allows just that. We can perform twisting and turning motions to strengthen core muscles and the buoyancy in the water doesn’t allow for assistance from the ground. Since Rue cannot use her feet to push of the ground to turn for the frisbee, it will require increased activation of the core muscles along the spine, and better coordinated movement. We can also practice movements similar to those your dog does in the air to catch, turn, or maintain control of their body while jumping. We can do it over and over focusing on any particular movement without the constant concussive force of landing. This is a great “off” day type of exercise. The low intensity gives us the opportunity to improve our dog’s aerial performance without the effort of our dog continually jumping & landing during a typical training session. Rue is balancing on a half ball, on a boogie board, on the water. This is premium balance training with less risk of injury during a fall. Balance Training. Like your dog’s feet that are fixed or touching a surface when training on land, stability equipment is fixed to or touching solid ground. However, we can take balance training to a whole new level by providing an unstable surface as a foundation, and then building on top of that. The corrective movements or muscle engagement to maintain balance on floating balance equipment has to be even more subtle, sensitive and controlled. It’s easy to lose balance because the energy dissipates into the water instead of being returned from the ground. Luckily, if your dog does fall, no harm will come to him as the pool is much more forgiving than the ground. Additionally, balance training strengthens the stabilizers of the joints and the spine, something swimming does not. Rue is weaving through the poles while swimming. This is great training for coordination, flexibility and strength in the spine. Coordination Drills. Swimming requires coordinated movement that is different than the coordinated movement needed for walking. 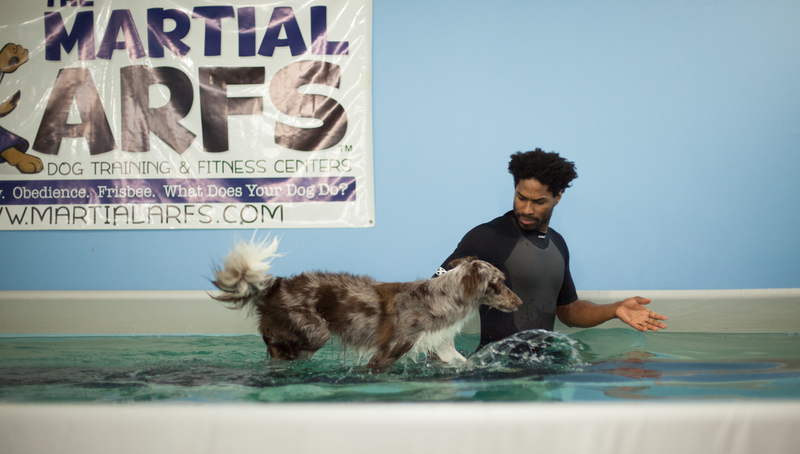 The greater variety of coordinated movements you have your canine athlete take part in, and accel at, the better athlete they’ll be. There are a multitude of coordinated movements you can have your dog do while in the water other than their regular swim stroke. Circles, left and right for example. This is a much more complicated move for your dog when their feet aren’t touching the ground. Weaving is another coordinated movement. You can set up weave poles in the water and have your dog weave through them as they are swimming. This low intensity exercise will improve coordination and spinal fluidity, and, as with all pool exercises, with minimal stress on the joints. Dogs seldom walk in just a straight line. Rue can walk at any angle along our bench, turn, walk sideways, backward, hop left & right, all options of movement are available. This better replicates life and sport. Movement Variation. 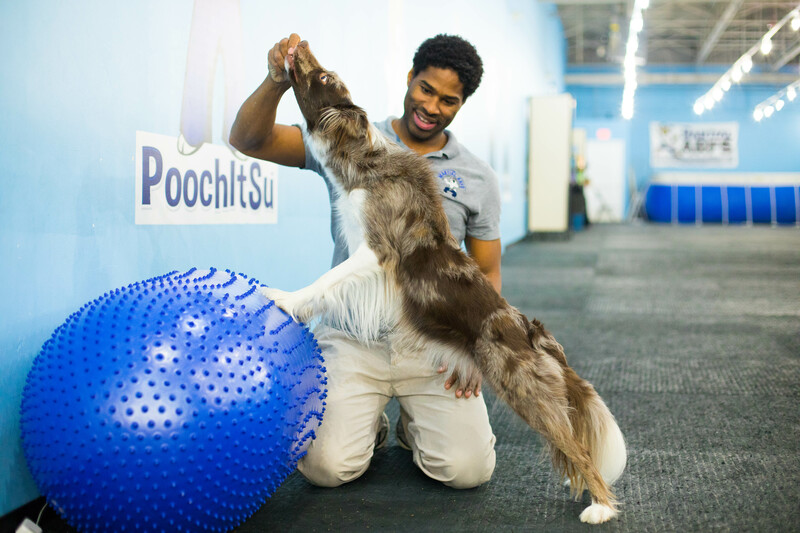 To properly condition our dogs we have to incorporate activities and exercise that move limbs throughout their full range of motion, at multiple angles of placement, amid wide ranges of torque. A device or machine that limits or cannot replicate this variation, limits your dog’s conditioning potential. As well, the demands of sport or intense activity cause dogs to sometimes make awkward movements. It is during these awkward movements injuries can happen. Open Water Exercises permit your dog the freedom to move any limb in any way at anytime. As well, the variety exercises of OWE allow you to recreate the movements of your dog’s sport, or any awkward movement your dog might make when participating in that sport, but under your guidance and control. 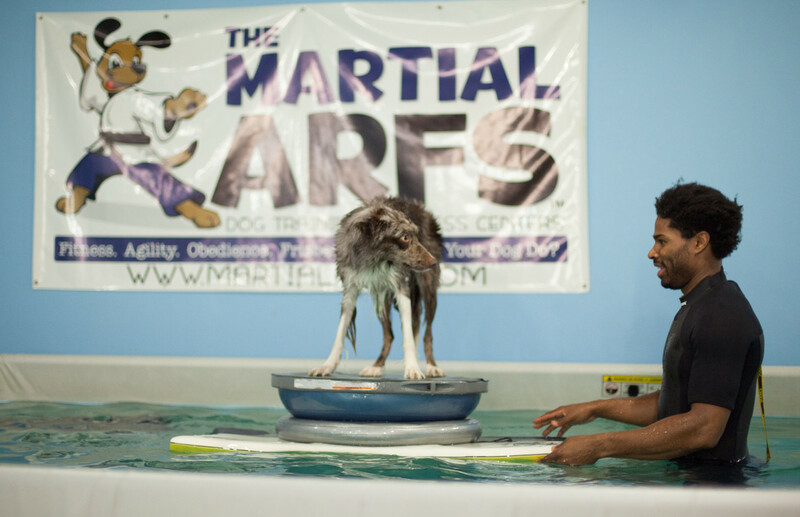 This will help both improve your dog’s performance, and help prevent the injuries that can arise from sport and life. We can recreate any land activity. Rue jumps to take the frisbee out of my hand, but will land in the water and cause less stress on her joints. Variety Of Exercises. Any part of a conditioning program should offer variety. I wouldn’t do just one exercise on the peanut, I wouldn’t do just one exercise on a treadmill, and I wouldn’t do just one exercise in the water. The concept of Open Water Exercise creates a great variety of exercises because there are a number of exercises unique to water, (for example, swimming), but also you can recreate almost any land based exercise in the water for an added benefit! I can use a lake, pool, or beach to do more exercises than I’d every have time to enjoy with my dogs. Swimming is the one water exercise that everyone thinks of, but as I’ve talked about in this blog post there are so many other functional conditioning exercises that you can do above and beyond swimming. You’re limited only by your imagination and desire to improve your dog! As always, it is best to seek instruction from a veterinary or canine conditioning professional before starting a conditioning program with your dog. And don’t forget to sign up in order to be notified as to when our next blog post is out. Watch the video below to see how some of these exercises look live! 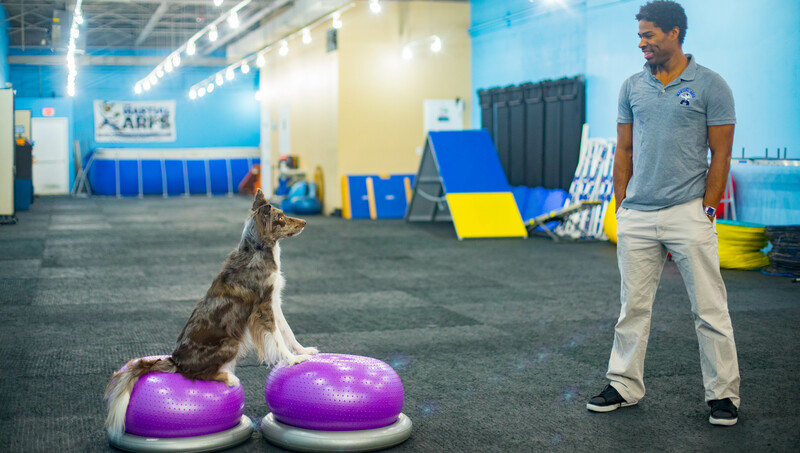 This is so cool and important for performance dogs, rehab patients and even for the family pet. I would love for this facility to be available in Missouri. It would be centrally located for the dog lovers in the midwest. This stuff all looks SOOOOOO cool I may have to quit my job and spend ALL my time at Martial ARFS !!!! This is so amazing! More info please!!! Any plans for a Raleigh, NC location? We’d love to have a location in Raleigh! Please like us on facebook, share and spread the word. It will make it easier for us to grow and get a location down there! What more information about us would you like? I’m interested in how you secure the weave poles to the bottom of the pool? Hi Marion. They are placed on a standard metal weave pole base. I have used the weave bases in the pool – works really well. Thanks. What are the platforms you use? 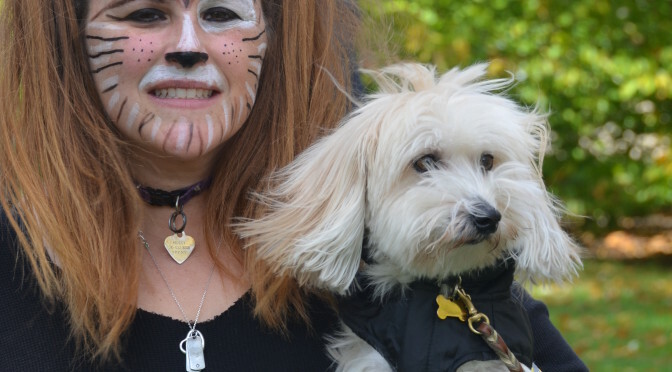 You and your dog just awesome.It will help me for training my dog.All the training are just awesome. when is the next online class for this water conditioning? where are you located? i am in Massachusetts . Unfortunately we’re not sure. We’d like to do one soon.